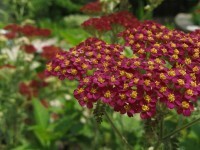 Lovely compact variety of Achillea with cherry red flowers. Height 60cm so perfect for mid border planting or indeed in pots. Drought tolerant once established. Loved by butterflies and bees. Full sun. Hardiness: Hardy: the plant may tolerate temperatures down to about -10C or 13F. Soil conditions: Well drained soil.